Since all oils contain about 120 calories and 14 grams of fat per tablespoon, using an oil mister or cooking spray can save you hundreds of calories per meal by significantly reducing the quantity of oil you are using. Misters or cooking sprays can be used to flavor foods and to create a nonstick surface for sauteing, grilling, baking, or any form of cooking. Use olive or canola oil to fill your mister — even though both still have calories, they’re low in saturated fat and better for your heart. You can also fill your mister or a spray bottle with salad dressing to keep the calories down. Expect to pay $10 to $20 for a good mister (e.g., Misto Sprayer), which you can find in any cookware or department store. If you’d rather use a ready-made version like PAM, keep in mind that although it appears to be calorie-free, a one-second spray contains about seven calories — but you would need about 17 seconds to equal one tablespoon of oil — so you’re still better off. Steaming is a terrific way to keep calories low without losing valuable nutrients. You can steam chicken, fish, or vegetables — they’re all delicious. For about $15 or so, you can pick up a stainless steel steamer basket, which you insert in a pot of boiling water — they are efficient and easy-to-use. For extra flavor, use other liquids besides water (e.g., lemon juice, wine, soy sauce, flavored vinegar) or add your favorite spices (e.g., thyme, rosemary, garlic). Or you can get an electric vegetable and rice steamer, which is a good investment. The Turbo Convection Steamer made by Cuisinart (which costs about $70) has a two-tier design that allows you to steam different foods at the same time. Everyone should have nonstick pans in the #kitchen; they make them for almost every cooking occasion. With a nonstick skillet and a quick blast of cooking spray, you have a recipe for success for any meal — from your vegetable and meat dishes, to stir-fries and pasta sauces or even egg white omelets. A nonstick surface allows you to control the fat content without sacrificing flavor. Cook with low-sodium chicken broth or white wine for additional flavor and moisture without added fat. A good nonstick frying pan (like Calphalon) will cost about $30 or so. Keep in mind that you will need to replace your pan as soon as it looks worn out. These pans don’t last forever, and it’s essential to keep the surface nonstick or you will find yourself using more and more oil to get the job done. Believe it or not, when it comes to dishes, size matters. Experts have demonstrated that the smaller your plates, cups, or bowls — the less food you are likely to consume. I’ve seen this in my own kitchen. I used to have these oversized bowls that probably held about 3 cups of cereal. I replaced them with bowls that hold only about one cup and consequently cut back on my cereal consumption. 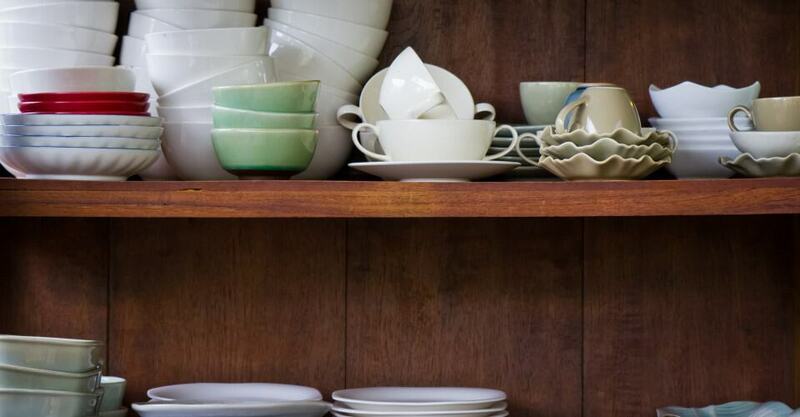 It’s a good idea to measure how much food your plates, bowls and glassware hold. This will allow you to keep a closer watch on your portion sizes without stressing out. Instead of making a batch of popcorn on the stove or buying microwave popcorn, invest in an air popper and a bag of kernels. You get more popcorn for less money — and you’ll save plenty of calories and fat grams. Air-popped popcorn has about 30 calories per cup — not a bad treat. Or as an alternative, NordicWare makes a microwave-safe container you can use to pop your own microwave popcorn (about $9). You can use these ovens to cook chicken, turkey, ribs, Cornish hens, kebabs — just about anything that you can grill. The concept of a rotisserie oven is to cook food using its natural fat so no additional oil is necessary and the natural great taste of the food is maintained. If you don’t want to spend the money on a rotisserie oven, try a roasting rack that suspends the meat above a roasting pan. For extra flavor, season the meat with your favorite spices, such as rosemary or turmeric, before roasting. Indoor grills allow you to enjoy grilled foods when outdoor grilling is just not possible. These grills are usually compact enough to store on a table or countertop right in your kitchen. They use electric burners to provide smokeless, even heat and offer a nonstick surface that is much easier to clean than a standard outdoor grill. They work particularly well for vegetables, meat, fish and chicken. And best of all, they are designed to drain away unnecessary fat and grease through special sloping grooves on the grilling surface. One of the most famous indoor grills on the market is the George Foreman Grill, which starts at about $20. Alternatively, opt for one of the nonstick grills that sit on your stovetop and are designed to drip excess fat off the cooking surface into a pan filled with water. Le Creuset grill pans cost about $60 each, and the more affordable Chefmaster stovetop grills run about $15 to $20. If you’re going to cook, you need somewhere to store leftovers. Invest in a durable set of containers in various sizes and shapes (with lids too). You can get the reusable ones by Ziploc or GLAD which are also dishwasher-safe. This way, you don’t have to feel obligated to clear your plate or finish everything in the pot. These containers are really handy for bringing your healthy leftovers to the office — saving you calories and money. How much are you eating? It’s anyone’s guess. Most people underestimate their portion sizes, which is why savvy dieters are using kitchen scales — they’re not just for cost-conscious restaurant chefs. These scales take the guesswork out of estimating portion sizes so you can figure out exactly how much you are eating. Salter makes a variety of different kitchen scales, which typically sell for about $50 to $100, but less expensive scales are available too. There are also scales that give you the nutrient information electronically — right on the scale — so you don’t even have to look it up. Measuring cups, spoons, and ladles are also critical tools for the conscious eater. These are inexpensive and make it so much easier to stay on track with your portions. Gravy is often the best part of the dish — but it’s full of fattening grease. For about $15, you can purchase a gravy separator (such as the one by Sur La Table). This neat little device looks like something that belongs in a laboratory rather than a kitchen — and it actually separates the fat out when you’re pouring gravy from it.